Create two groups in the foreground. Try to gain depth with positioning friends in the background. Pay attention to details like the kissing couples. This very complex gouache painting shows a noble hunting party in the woods. 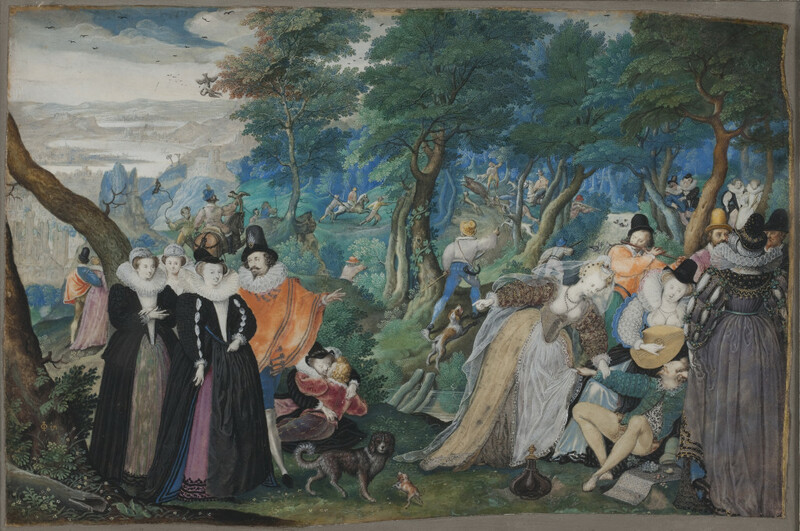 In the foreground are two scenes: on the right side, a frivolous gathering of musicians and courtesans. On the left, a group of virtuous women (dressed in black) are led to the scene. The painting is meant to be an allegory on the conjugal love. Born in Rouen, Isaac Oliver moved to London in 1568 with his Huguenot parents Peter and Epiphany Oliver to escape the Wars of Religion in France. He then studied miniature painting and developed a naturalistic style, which was largely influenced by Italian and Flemish art. After the death of Queen Elizabeth I, he became a painter of James I’s court, painting numerous portraits of the queen Anne of Denmark and Henry Frederick, Prince of Wales. Some of his work is housed in Windsor Castle. Some of his pen drawings are located in the British Museum.